Trying to choose between anti-malware tools is not an easy task. Numerous programs claim to be the best and promise to make your computer virus-free. 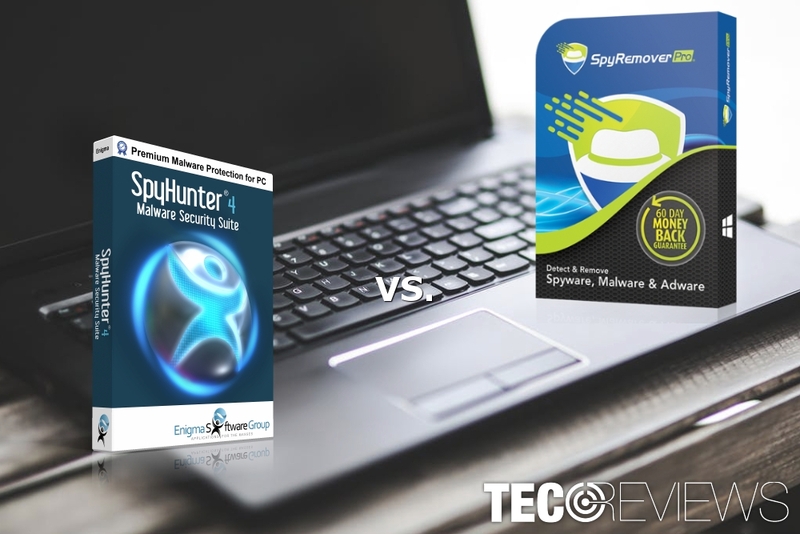 Today we are going to compare two malware removal tools – SpyHunter and SpyRemover Pro. They have not only similar names but offer similar features for the same price as well. We have tested these tools for a few weeks and provide our opinion which security software is better at the end of the article. SpyHunter is an anti-spyware created by Enigma Software. The program is compatible with all Windows OS versions starting from Windows XP. The security software has a user-friendly interface that allows performing all necessary tasks even if you are not a highly skilled computer user. does not provide real-time protection. 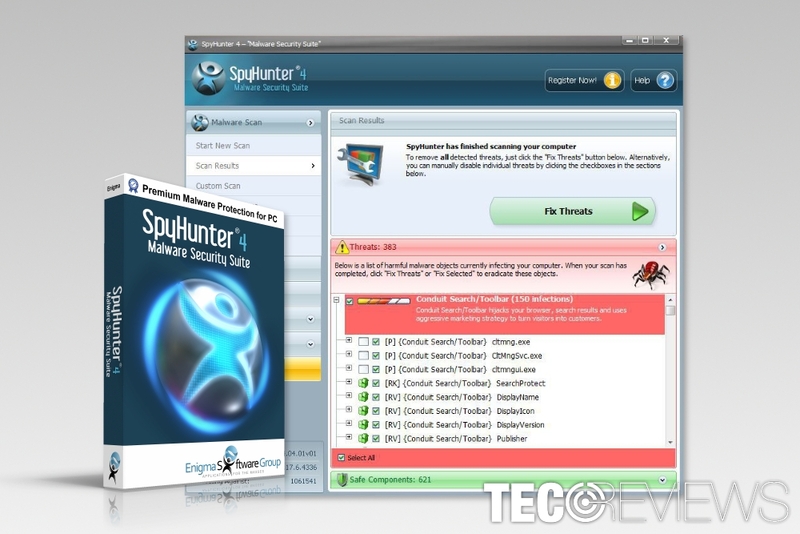 SpyHunter 4 is the latest version of the security software that promises to protect computers from cyber threats. The program has a free scanner that can be downloaded from the official website. However, the full version of the program that eliminates cyber threats costs €34.99. The security software promises to detect and eliminate all recent cyber threats, including, spyware, ransomware, keyloggers, rootkits, trojans, etc. We have tested SpyHunter on several computers, and we can ensure that the scanner works properly and detects recent malware. One of the main advantages of the anti-spyware is that it receives latest malware definition updates. For this reason, a program is capable of detecting recent viruses. The demo version of SpyHunter works only as a scanner. To eliminate detected infections, users have to obtain its license. We can ensure that the free version does not work as a scareware that tricks users into purchasing the license. Our analysis proves that free and paid versions of the program detect same infections in the test computers. A rootkit is one of the nastiest and hard to remove cyber threats that takes control over a targeted computer and prevents a user from accessing it. However, SphyHunter 4 is powerful enough to wipe out them as well. Obtaining security software might not be enough. Sometimes eliminating cyber threats becomes a challenging task even if you use a powerful security tool. However, Enigma provides SpyHunter users’ a customer support service that helps to solve software-related issues or remove malicious programs. Nevertheless, the software detects and eliminates various cyber threats without any problems; it has some disadvantages. The program runs system scans as soon as you boot the computer. Thus, it can slow down computer’s performance. It does not offer real-time protection. The program works as a cleaning tool. Thus, for full computer’s protection users have to obtain an antivirus. Additionally, there are numerous fake versions of SpyHunter that are lurking on Web. Thus, users can be tricked into installing a fake version of the program that might be available on third-party sources. Therefore, it’s important to obtain the program from the developers’ site. SpyRemover Pro is anti-malware software that was founded in 2015. Thus, it’s a young malware removal software. However, the official site claims that it is “one of the industry leaders.” Though it’s quite an ambitious statement, we believe that the program might achieve this title in the future. Anti-malware program promises to detect and remove various cyber threats, including spyware, adware, various computer viruses, and malware. SpyRemover, just like Spyhunter, has two versions – free and paid. Free version works a scanner that can detect cyber threats. However, in order to remove them, you will need to obtain a license. The paid version of the program also allows blocking cookies and ads while browsing the web. Additionally, if you are not satisfied with the product, you are offered 60 days money back guarantee. Thus, it might be worth trying. Even though it is classified as malware removal tool, it also offers real-time protection. It is definitely an advantage compared to SpyHunter. However, our analysis revealed that its detection rate is not as high as the previous program. We have tested both – free and paid version of the program. Thus, we have no doubts that both of them delivers correct scan results. Therefore, demo version does not work as a shady marketing tool that wants you to obtain the license. However, if SpyRemover Pro detects some cyber threats on your PC and you want to remove them, you will need to upgrade it. Virus removal is quick and does not diminish computer’s performance. Therefore, during the system scan, you will be able to continue using your PC without any problems. The free version of the program does not include malware definition updates. Database updates are available only for the paid version users. However, this feature is extremely important because new cyber threats emerge daily. Therefore, having up-to-date tool helps to minimize the risk of cyber attack. Developers of the software promise 24/7 live remote support. However, many users report having problems with it. Indeed, we have tried their service, and it was not as helpful as we would expect. Paid SpyRemover users should get instant support. However, in reality, it might take some time. SpyRemover Pro might seem better tool due to its real-time scanning feature. However, SpyHunter offers a higher detection rate. Therefore, if you need to clean an infected computer, it’s better to choose malware removal tool that can detect more cyber threats. SpyHunter’s automatic system scans might be annoying. However, they allow making sure that you are using a safe and clean computer. SpyRemover Pro is quite a new player in the anti-virus market. We expect this tool to improve soon and offer better functionality. In the meantime, for full computer’s protection, we recommend combining Enigma SpyHunter with a reputable antivirus program. ^ Gary Marshall. The best free anti-malware software 2017. TechRadar. IT insights for business. ^ Tamlin Magee. Most dangerous new cyber security threats 2017: ransomware, spearphishing, IoT botnets. Computerworld UK. Business technology and IT management news. ^ Tony Bradley. What Is A Rootkit And How Can You Avoid Them?. Lifewire. The website about computers and technology. ^ Vangie Beal. What are Cookies and What Do Cookies Do?. Webopedia. Online Tech Dictionary for IT Professionals.